I fell crazy in love with Kureyon Sock a week ago, and the best thing to knit from it must be a striped sock (or possibly two) knit with rows from each end of the skein. Super cute, and this colourway (102) I brought home from Nysta is particularly sweet n sour. On a less brighter note: This picture does not do neither the sock nor the yarn justice, but as you can see I'm having some problems with the striping, since both yarn ends shifts into the same colour from time to time, making the stripes very unstripey. My only plan right now is to make them very long, so the amount of stripes will increase and the blurry fields will seem fewer. 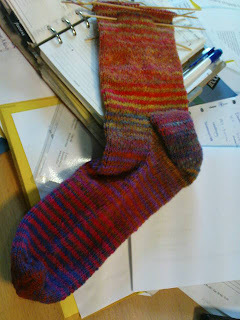 I've looked at other similar socks on Ravelry, and it's possible that this happens when you knit stripes like this and that the sock will still look striped in the end. I'm keeping my fingers crossed for stripes. I'm quite excited to try a few new moves in the art of sock knitting. First of all, I'm knitting toe up, with a beautiful magical cast-on Fi taught me. I messed it up, of course, but it's still brilliantly invisible and clever. (I've no idea where she found it. I'll get back to you on that one.) I then knit a Dutch heel backwards, as described by Brooke Chenoweth Creel in her Widdershins sock pattern. I'm not very fond of short-row heels, since they don't give the increased width I feel is necessary for a regular foot as you approach the heel area. (This heel worked out quite OK, I think, though I might have started the heel a bit too late. But nothing serious.) And now I've just started increasing for the calf as described at Streets and YO's. All in all, I might be onto the perfect sock pattern, a quest Fi and myself started earlier this fall. We'll keep you posted. 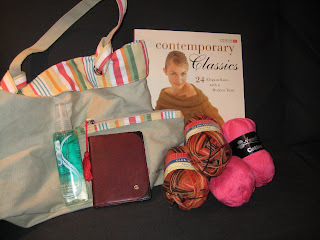 This yarn is beuatiful but has a lot of personality (and not necessarily the good kind). It grips and clings to itself, it's rough and it twists. And it doesn't stretch as much as regular sock yarn, but that doesn't have to be a bad thing. My sock is very tight, and with some calf shaping and tough ribbing I'm sure it will stay in place.